The man identified as the main suspect in the gruesome murder of a young Dutch woman told investigators he had “freaked out” during an argument, a court heard on Friday. The victim, Shannon Mak, 30, was found with her neck slashed outside an apartment in St Venera on August 3. Just hours later, police officers went to the suspect’s flat, where they found him lying on a sofa bed, and fairly calm, inspector Lydon Zammit testified. He was arrested and taken to the police headquarters for questioning. He was testifying before magistrate Simone Grech on Friday during the compilation of evidence against Jelle Rijpma, the victim's 22-year-old former boyfriend. Inspector Kurt Zahra said Mr Rijpma said his former girlfriend had driven him back home after a party. An argument broke out and he had grabbed a kitchen knife, took the woman to the spot where she was later discovered and cut her throat, before running away. However, he refused to answer any further questions about the murder when releasing his statement in the presence of a lawyer, Inspector Zahra explained upon questioning by parte civile lawyer Stefano Filletti. A resident, taking out his garbage early, was the first to spot the lifeless body of the woman covered in mud, lying in a pool of blood between a parked car and a boundary wall. Robert Spiteri, who happened to be a first aider, was putting out his garbage bag just after 6am when he spotted a figure lying on the ground some three metres away. He first thought it might have been a drunk person, before realising it was a corpse. Without touching the woman, he called 112 for assistance. The victim had a large wound on her neck, later confirmed to have been the knife wound which had caused her death. 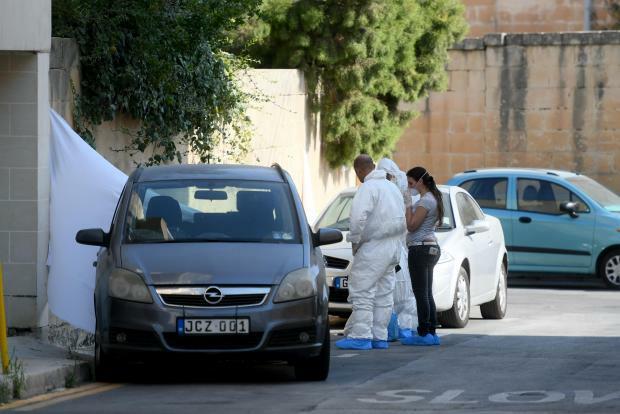 Earlier on in Friday’s first hearing, prosecuting inspectors Robert Vella from the Ħamrun police station and Kurt Zahra from CID, explained how they had zeroed in on the prime suspect just hours after the gruesome discovery. Three keys attached to an orange keychain lay next to the corpse, one of which matched a blue Fiat Punto registered in the name of Ms Mak, parked just metres away from the crime scene. A white paper bracelet on the victim’s wrist bearing the word 'Evolution' enabled investigators to figure out the woman was an i-gaming employee who, the night before, had attended a company gathering at a beach club in Armier. Contacts with the company confirmed the victim had worked as a customer support officer since 2015 and had been in a relationship with her colleague, Mr Rijpma, who resided at Sta Venera. Although the couple had reportedly broken up some two weeks before the incident, they had attended the party together, leaving at the same time, the investigators were told. During the party, Ms Mak had been seen speaking to another man, the court was told. The woman had occasionally opened up to her friends, telling them that the cause of the break-up was the aggressive behaviour of her then-boyfriend who had allegedly once grabbed her by the neck. A telephone call from a foreign resident in St Joseph High Street, Sta Venera, later that same morning, led to the discovery of the weapon believed to have been used in the murder, a small kitchen knife with a blade measuring some 11-12 centimetres. The resident had found the blood-covered instrument on his terrace, together with a mobile phone, and had immediately called the police. CCTV footage taken from this secondary crime scene showed a man running towards the place where the knife and mobile phone were discovered. The figure, identifiable from his tattoos, led the police to believe that it was Mr Rijpma, the court was told. A neighbour had told the police that he had spotted Mr Rijpma return to his flat some time around 1am, carrying a haversack, and had later heard a woman raising her voice. The compilation continues in September. Lawyer Leontine Calleja was defence counsel.